REGINA, SK – Bushwakker Brewpub has announced the upcoming release of a new limited edition beer to commemorate a milestone anniversary of one of Saskatchewan’s top cultural institutions. The Saskatchewan Filmpool Cooperative is “a non-profit artist-run centre which supports and assists independent visionary film and video production in Saskatchewan” via production assistance, funding, screenings, and other forms of promotion and outreach. 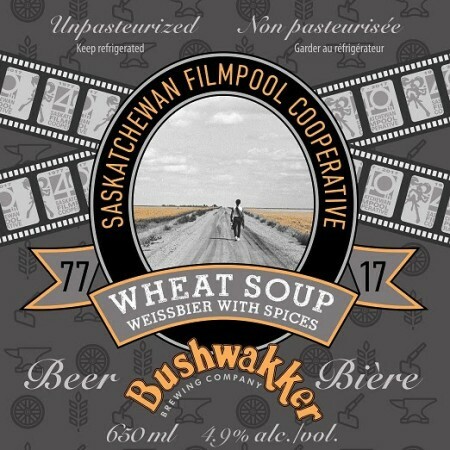 The Filmpool is celebrating its 40th anniversary in 2o17, and to mark the occasion, Bushwakker will be releasing Wheat Soup, a limited edition spiced weissbier named after a 1987 film that was produced with support from the organization. Wheat Soup Weissbier will be released at Bushwakker this Saturday September 9th at 2:30 PM. Wheat Soup directors Gerald Saul and Brian Stockton will be on hand to tap the first keg, and the event will also include a screening of the film, presentations, door prizes, and more. In addition to being available on tap at the brewpub, 400 bottles of Wheat Soup will be on sale in the Bushwakker retail store while supplies last.